Sparkling wine has unfortunately been type-cast as a wine for celebrations, receptions, holidays and congratulating accomplishments. The dramatics of presenting a beautiful bottle, popping a cork and an eruption of bubbles aids in a joyous occasion. But why only these particular times of year? The composition and profile of most sparkling wines allows for enjoyment all year-round! There is no other style of wine that will allow for such diverse food pairings, from Thai curry to crème caramel. So why do we not stock our cellars and wine racks with more bubbles? 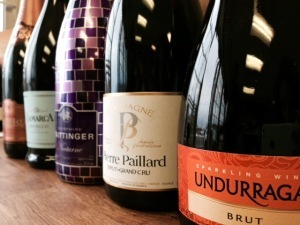 This may have to do with a few fallacies that have plagued the popularity of sparkling wine in main-stream wine world. 1. Champagne is expensive. This is correct, most Champagne ranges upwards of $50. If Champagne isn’t in your budget, try Prosecco, Cava, sparkling wine from California, Chile or Luxembourg! 2. Sparkling wine is too sweet. Au contraire! Sparkling wines come in various levels of dryness, from 0 grams per litre of residual sugar (RS) to over 5o g/L RS. The RS in sparkling wines is balanced by mouth watering acidity. If you think sparkling wine and Champagne is too sweet for your palate, look for bottles that are Brut Nature or Extra Brut (0-6 g/L RS). 3. Bubbles are for special occasions only. As previously mentioned, parties and festivities are a perfect time to pop a bottle, but so is Monday, Tuesday, Wednesday…. you get our point! The bountiful acidity and refreshing bubbles allow for sparkling wines to pair with pizza night to Chinese take-out. Sparkling wine can be made in several different ways: classic (or traditional) method, charmat or tank method, and carbonation. Just as there are different ways to create the bubbles, there are many different ‘types’ of sparkling wine around the globe. From Italy’s Prosecco, Spumante and Lambrusco to Champagne, Crémant d’Alsace and Spain’s Cava. 1. 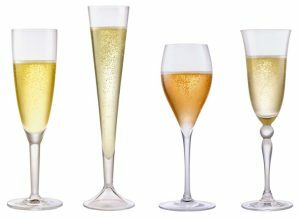 Of the techniques to make sparkling wine, carbonation is the most cost effective and usually produces budget-friendly alternatives to higher-end producers and Champagne houses. Carbonation is the process of taking a base wine and inoculating it with CO2, then it is bottled. 2. Tank method or sometimes referred to as Charmat, adds sugar and yeast to a base wine. In the large tank, the wine undergoes a second fermentation, where the yeast eats the sugar and produces CO2. Bottles are then filled from the tank. This method is used commonly for Prosecco from Italy and Cava from Spain. 3. The Classic method, or méthode classique (also referred to as Champagne method) is a process similar to the tank method, until the 2nd fermentation. After the sugar and yeast are added, the wine is put in bottles, where it undergoes the second fermentation, rather than this taking place in the tank. The bottles are rotated, a process called ‘riddling’ to stir the lees. The wine is then disgorged, a process of freezing and removing the lees that have settled in the neck of the bottle. Then the wine may go through dosage. Dosage is the addition of a ‘top-off’ of wine and sugar to fill the empty space in the bottle and add flavour. Then the bottle is corked. Obviously with many more steps, and lots more time involved, this method of producing sparkling wine commands a higher price per bottle! What kind of sparkling wine should you buy? Another factor impeding the popularity of sparkling wine and Champagne, is the intimidation factor. There is already so much to know and understand about still wines, that ordering a bottle at a restaurant or selecting one for your dinner party might seem overwhelming. Luckily, there are great wine stores and boutiques across the country that offer intelligent service without the pomp and arrogance. Never be afraid to ask for advice and suggestions! If you are keen to go rogue and make the decision on your own, here is a list of terms commonly found on sparkling labels. This should help narrow down the choices to a wine suitable for your palate. Vintage – The result of a single harvest, not a blend of vintages. In Champagne, they must age 3 years. Non Vintage – Blend of multiple varieties and vintages. Champagne houses create a non-vintage that is supoosed to be consistent year to year and representative of their brand and style. Rosé is made of a blend of red and white wine. Dosage is the sweetness level, and will comonnly be on the label. There is a list below of the different dosage levels. Sekt – German term for sparkling wine. The sweetness/dryness of a sparkling wine is identified by the brut level, and can range from bone dry to dessert-sweet! The sweetness in traditional method sparkling wines comes from the dosage, where the winemaker adds sugar and wine just prior to corking the bottles. This mixture can be produced with cane sugar, beet sugar or grape must. The brut level indicates the minimum and maximum residual sugar in the wine. Measuring the residual sugar allows us to classify the styles of sparkling wine, and hopefully help you understand your preferences. We are now all familiar with Champagne, but there are also other kinds of sparkling wines that are identified by their place or grape. The following are examples of wines that offer different styles and characteristics, while all providing some fizz. Champagne can be produced from Chardonnay, Pinot Noir or Pinot Meunier. The region of Champagne is in north east France, just NE of Paris. Within the region of Champagne, there are 5 sub-regions: Montagne de Reims, Cote des Blancs, Vallee de la Marne, Cote des Sezanne, Aube. Champagne is home to approximately 82,000 acres of vineyards and produces about a million bottles per year.Classic Method produced wines generally have long lasting bubbles that are small in size. Cava is a Spanish sparkling winemade from Xarel-lo, Macabeo, Parellada and other varietals like Chardonnay. Cava is produced in the traditional method, like Champagne. Compared to Prosecco, Cava is drier and less fruit-focused. Prosecco is an Italian sparkling wine made from the grape Glera. Prosecco is made mainly in the region of Veneto and Friuli. Most Prosecco producers use the tank method, making Prosecco more affordable. Expect off-dry, creamy and fruity qualities. Crémant is a sparkling wine that is made outside the region of Champagne, but produced with the same methods. Different regions have different guidelines on the production of their sparkling wine. You should always serve your sparkling wine chilled. The carbon dioxide in the wine becomes more soluble as the temperature of the wine decreases, allowing the CO2 to be released slowly and last longer. This will result in longer lasting bubbles. Ideally young Champagne and sparkling wine should be served at 8 degrees Celsius. More robust wines can be served slightly warmer. It will take approximately 2 hours to chill a bottle from room temperature if it is placed in a fridge. 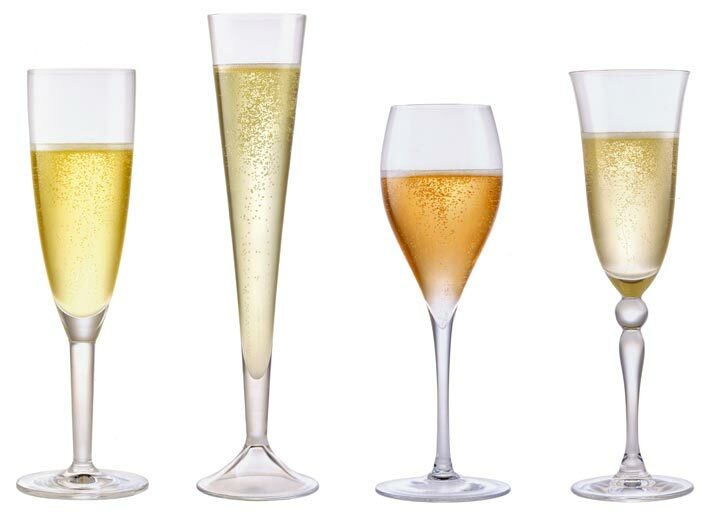 The Champagne flute is designed to maximize the bubbles and their longevity in the glass. The stem is important too! Holding the glass by the stem, rather than the bowl, will not warm the contents of the glass as quick. 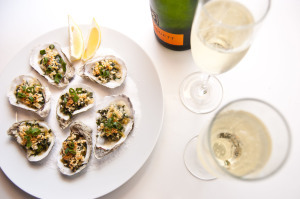 Extra Brut and Brut Nature pair best with smoked salmon, shellfish, oysters. Vintage Extra Brut and Brut Nature’s richness balance best with crab and lobster. Sec and demi-sec is when you are having desserts, crème brulee and fruit cake. Brut Rose will often have Pinot Noir in the blend, try Asian duck recipes or dishes with berry compotes. Prosecco, think Italian! Salad with Parmigiano, cured meats and charcuterie. Cava, when in Rome! The Spaniards have a flavourful Mediterannean cuisine, spice with paprika and salted white fish. Sparkling Shiraz, rare in Canada but common in Australia. A great alternative for summer BBQ’s and even blue cheese. Moscato- fruit tarts and desserts. Breaded and deep-fried foods will be cut by sparkling wine’s acidity. Don’t be afraid to try egg rolls, samosas or deep fried zucchini blossoms. Once you remove the foil and cage, keep your thumb on the cork. There is enough pressure in the bottle to pop without warning! Don’t shake the bottle like you won a Nascar race. We expect no one at your table wishes to be covered in sticky, delicious wine. The less noise and foam, the better. Carefully open the bottle and resist the urge to create a loud ‘POP’. Sabering can be dangerous, but if you insist, watch our video above for an example! Ensure that the bottle is cold, and remove the foil and cage. Aim the bottle away from people, pets and valuables. At a 45 degree angle, run a knife or swordup the vertical seam of the glass bottle. Champagne houses create a non-vintage that is supposed to be consistent year to year and be representative of their brand and style. Non-vintage is suitable to enjoy upon release and does not require cellar aging. Vintage Champagne and classic method sparkling wines can be aged, creating more expressive secondary flavours, while you will see the bubbles fade slightly. This is a welcome trade-off for well made sparkling wine. Storing or ageing a bottle of sparkling wine is slightly different than a still wine. It should still be kept in a cool, dark, neutral room, but instead of laying down the bottle, stand it up. If you have an unfinished bottle (tisk tisk), you will need a special stopper to cork the wine. The life-span of an opened bottle is relatively short. If the wine is less than half full, expect it to only last a day at most. If there is a glass or two left the next morning, they will be perfect for a mimosa! Be sure to let us know of your comments and questions. We would love to hear from you! Tell us about your favourite sparkling wine, the time you broke the lamp with a shooting cork or, if you still haven’t found a bottle of bubbles you like. We’ll accept the challenge. Last minute wine gifts – Christmas is almost here! Revana, a perfect gift for the holidays.